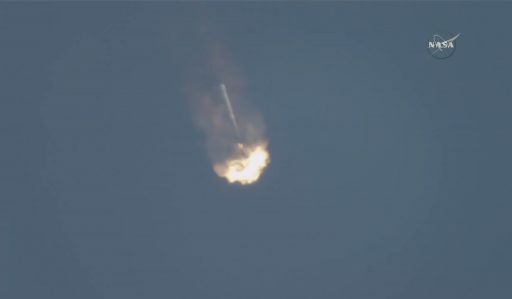 SpaceX’s Falcon 9 rocket thundered away from Florida’s Space Coast Saturday afternoon, starting an eight-minute round-trip for its first stage booster and a ten-minute ascent into orbit for the Dragon SpX-11 cargo spacecraft sitting atop the 65-meter tall rocket to head off on a critical resupply mission to the International Space Station. The company’s eleventh operational Dragon mission – the first to re-use a previously flown spacecraft – is ferrying three high-profile external payloads to the Space Station to probe the interior of the densest stars in the universe, test out solar array technology to satisfy the demand of future power-hungry satellites and deliver a new Earth-science platform to ISS to host up to four remote-sensing instruments. 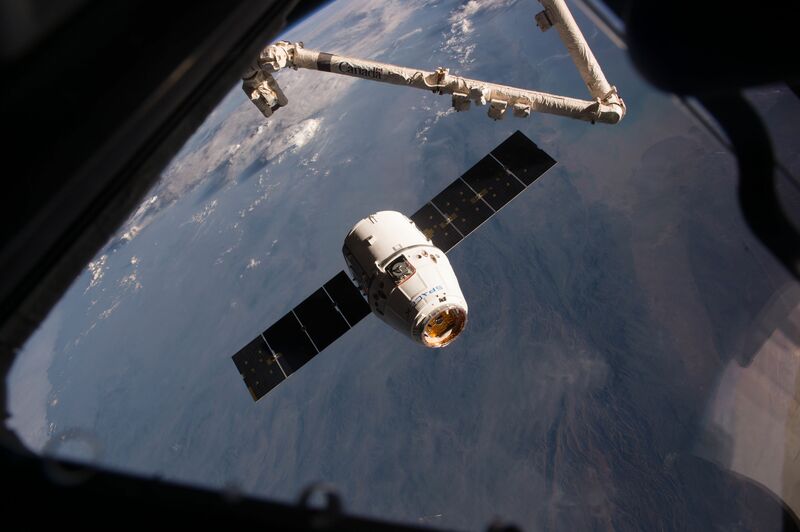 Hitching a ride aboard the Dragon is a group of 40 mice participating in a potential groundbreaking demonstration of a drug promising to reverse bone loss incurred by astronauts during prolonged space travel and Earth-bound patients with Osteoporosis. 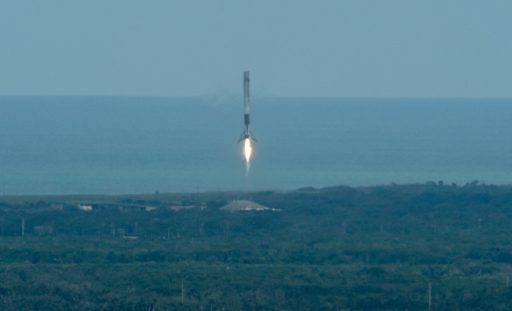 While Dragon was still blazing toward orbit, the rocket’s first stage reversed course and accelerated back toward Cape Canaveral for a rocket-assisted touchdown in Landing Zone-1 just 15 Kilometers south of where it launched from. 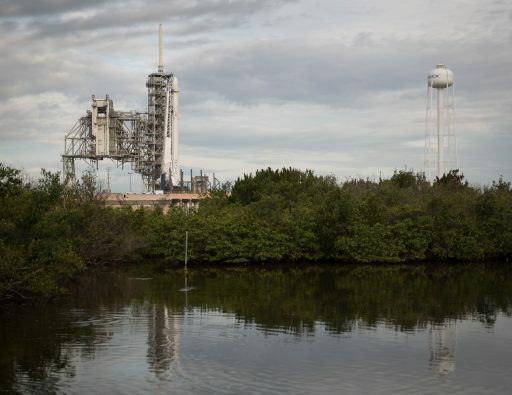 Checking of SpaceX’s fifth successful LZ-1 landing, the 47-meter tall booster came to rest on its four landing legs after a picture-perfect round trip to the edge of space and back – adding to SpaceX’s inventory of ‘flight-proven’ boosters available for re-use. Dragon also received a smooth flight, separating from the rocket’s second stage ten minutes after liftoff to set sail on a two-day rendezvous with the Space Station for a robotic capture on Monday to mark the start of a month-long stay, facilitating the delivery of 2.7 metric tons of cargo to the orbiting laboratory. Saturday’s launch was the 100th from historic Launch Complex 39A, looking back at a five-decade history supporting 12 launches of NASA’s mighty Saturn V rocket including all Apollo missions to the surface of the Moon and 82 Space Shuttle launches. SpaceX took over LC-39A via a 20-year lease from NASA in 2014 and so far has flown six Falcon 9 missions from the storied launch pad. 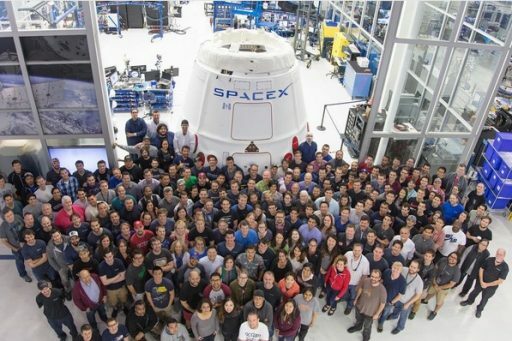 The California-based company hopes to return the complex to human spaceflight operations soon with the crewed version of the Dragon 2 spacecraft, targeting an initial uncrewed test flight ahead of a crewed mission in the first half of 2018. 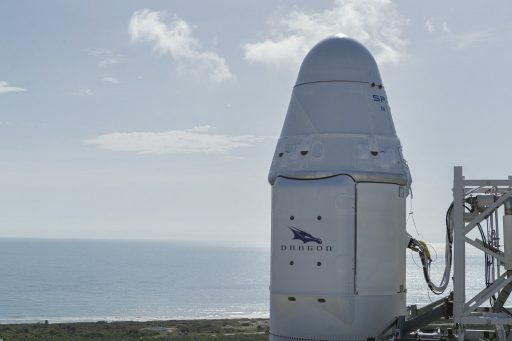 The SpaceX Dragon has a critical role within the Station’s cargo fleet as the only vehicle capable of returning hardware to the ground via a parachute-assisted splashdown landing in the Pacific Ocean. Return capability is critical for ISS science as samples collected for hundreds of experiments need to be flown back for analysis with ground-based laboratory methods. There is also desire to fly failed systems hardware back to Earth for inspections into the circumstances of equipment failures – like the recent computer box failure that prompted an unscheduled spacewalk. A spacecraft designed for an intact return also affords the opportunity of being refurbished and re-flown if design margins allow for multiple mission cycles. 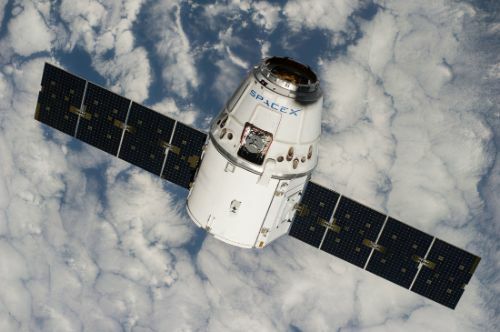 This mission is the first re-use of a Dragon spacecraft after SpaceX worked with NASA to demonstrate the vehicle could support multiple missions as NASA’s Commercial Resupply Services Contract initially specified a new Dragon to be used for every resupply mission. 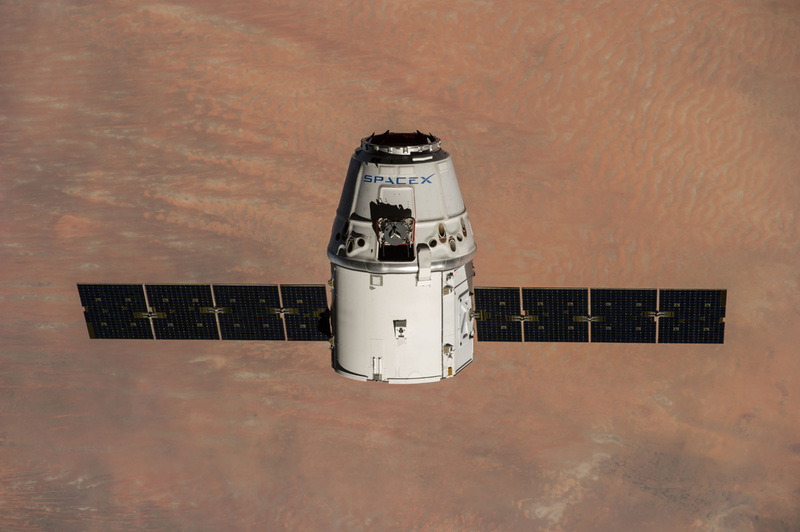 Dragon C106, the sixth production vehicle, flew to space in September/October 2014 on a 34-day cargo-delivery mission to ISS and underwent refurbishment after coming back from orbit. SpaceX says most of the Dragon craft of the SpX-11 mission was in space for SpX-4 but some components were changed out to avoid concerns associated with hardware lifetime limits. Unchanged from the SpX-4 mission are the Dragon pressure vessel, the propulsion system and most avionics components. The Trunk Section, discarded as the end of the mission, is obviously new and so is the heat shield, some external panels and the spacecraft’s batteries that were replaced out of an abundance of caution as the initial Dragon missions suffered from sea water intrusion into battery compartments – a problem that has since been solved. Shipping out from California after refurbishment, Dragon received most of its cargo in the months and weeks prior to launch, hosting a total upmass of 1,665 kg inside its pressure vessel while the three external payloads amount to a mass of exactly one metric ton. Bolted into the trunk section of the craft are three landmark payloads headed to ISS. NICER, the Neutron Star Interior Composition Explorer, deploys the most time-sensitive X-ray telescope to space to probe the mass and interior structure of Neutron Stars, the densest stars in the universe, and study their potential use as ‘celestial lighthouses’ for deep space navigation. MUSES, the Multi-User System for Earth Sensing, is an articulated bench capable of hosting four Earth-science instruments like high-resolution cameras and spectrometers for commercial and scientific applications. Roll Out Solar Array Prototype – Photo: Deployable Space Systems, Inc. 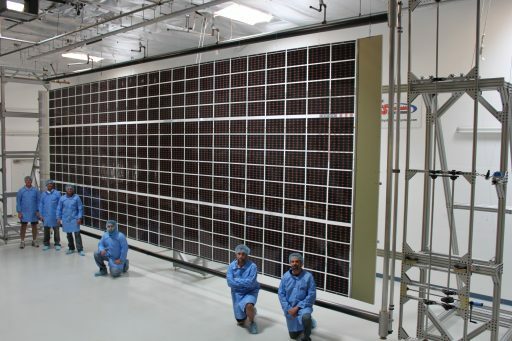 The third external payload is ROSA, the Roll-Out Solar Array – targeting a demonstration of a light-weight, flexible solar array that could be the answer for the ever-increasing power demand of satellites and deep space probes venturing out to far distances from the sun. ROSA will complete a week-long demonstration to verify its innovative self-deploying booms and structural & electrical characteristics – using ISS as a proving ground to retire risks for future missions relying on this type of power generator. Equipment inside the Dragon supports dozens of the 213 studies planned during Expedition 52/53 including several new experiments making use of the unique microgravity environment on ISS. The SpX-11 mission is carrying 1,069kg of science utilization hardware, 199kg of systems hardware, 242kg of crew supplies including food and hygiene articles, 27g of computer resources, and 56kg of spacewalk equipment. 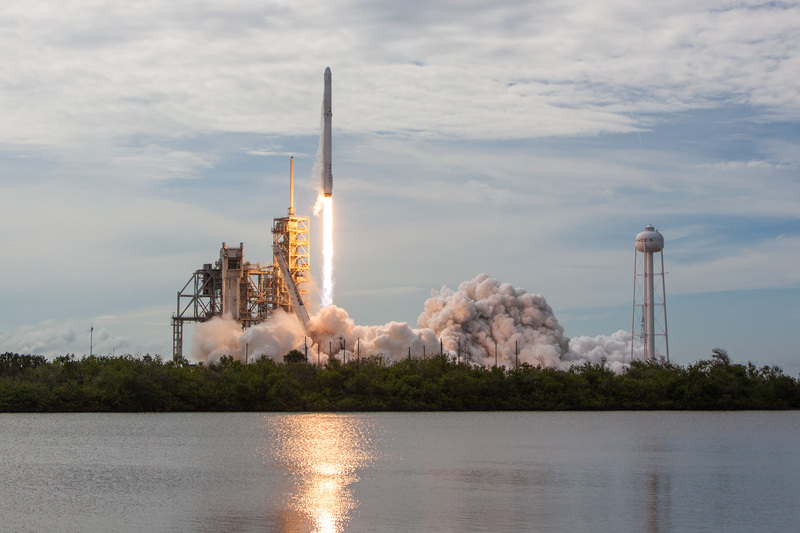 Saturday’s launch came right on the heels of SpaceX’s most recent mission on May 15 when an expendable Falcon 9 conducted the company’s heaviest Geotransfer delivery to date with the Inmarsat 5-F4 communications satellite. Establishing a stable pace of one East Coast launch every two weeks, including several booster re-flight missions coming up, the company hopes to fly out a busy manifest of missions that piled up as Falcon 9 struggled with establishing a regular launch rate, in part due to two groundings after major mishaps in 2015 and 2016. The launch campaign for the SpX-11 mission was characterized as very smooth. Falcon 9, still missing its payload, fired up its engines on Sunday for the typical Static Fire Test and was taken back to its integration facility to meet the Dragon on Monday and Tuesday before returning to the pad at noon on Wednesday with prior approval from the Launch Readiness Review. 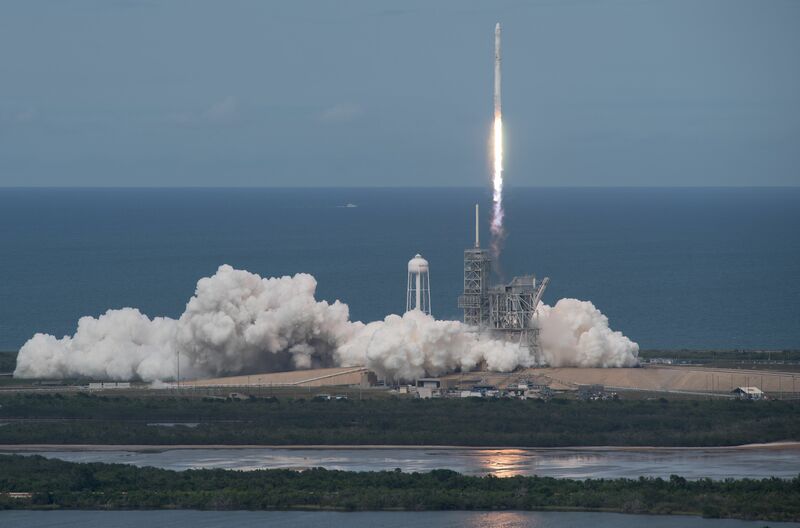 SpaceX proceeded into countdown operations on Thursday but ultimately had to abandon the day’s attempt due to unsettled weather moving over the Kennedy Space Center, prompting a scrub and 48-hour turnaround due to trajectory constraints. 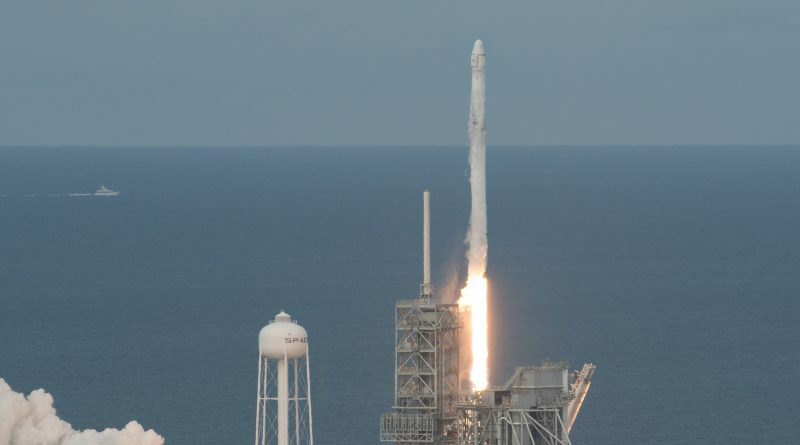 As a result, Falcon 9 was taken back to a horizontal position to allow a mobile White Room to be rolled up to the Dragon to facilitate the replacement of time-critical payloads – including the mice, fruit fly lab and a stem cell experiment exploring the effect of the space environment on heart stem cells of different ages. 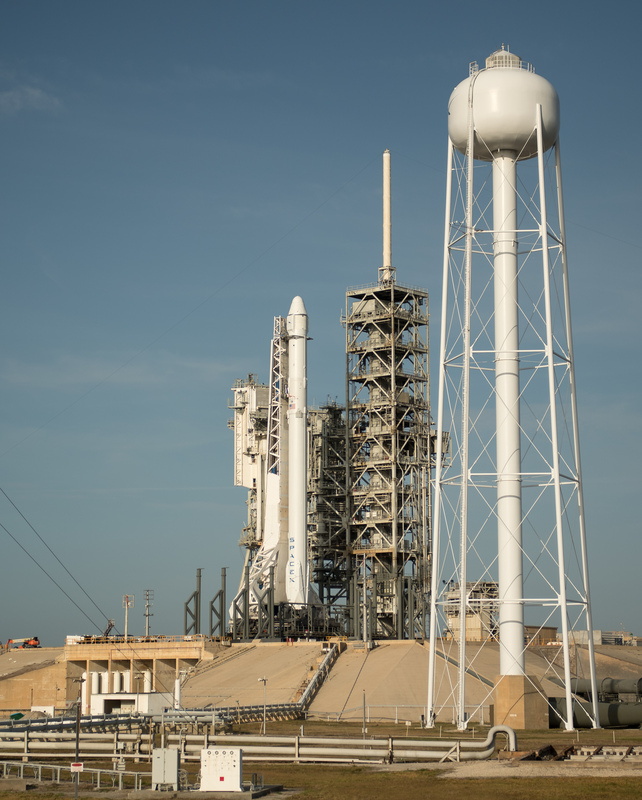 Falcon 9 went vertical at 8 a.m. local time on Saturday to press into a nine-hour countdown operation, beginning with the activation of the rocket’s subsystems and final close outs at LC-39A to set up for the fast-paced propellant loading sequence. All systems on the Falcon 9 checked out as planned, the Eastern Range reported readiness to support and the weather was shaping up, allowing the SpaceX Launch Team to provide a unanimous GO to enter the automated countdown sequence at T-70 minutes. 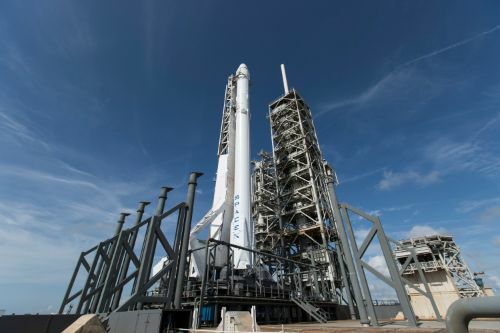 As the auto sequencer kicked in, Falcon 9 began receiving around 155 metric tons of rocket-grade Kerosene, chilled to -7° Celsius, while the Liquid Oxygen system entered final chilldown operations. 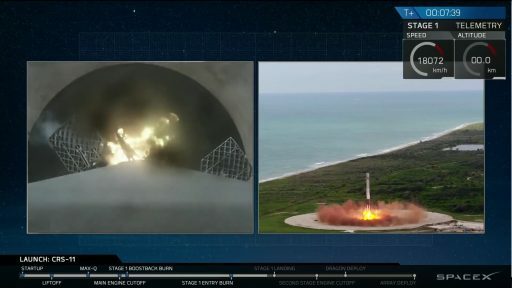 The densified LOX, sub-cooled to -207°C, began flowing into the rocket at T-45 minutes and flow rates were carefully throttled to ensure Falcon 9 reached flight mass as close to liftoff as possible with around 360 metric tons of LOX going into the two-stage rocket. 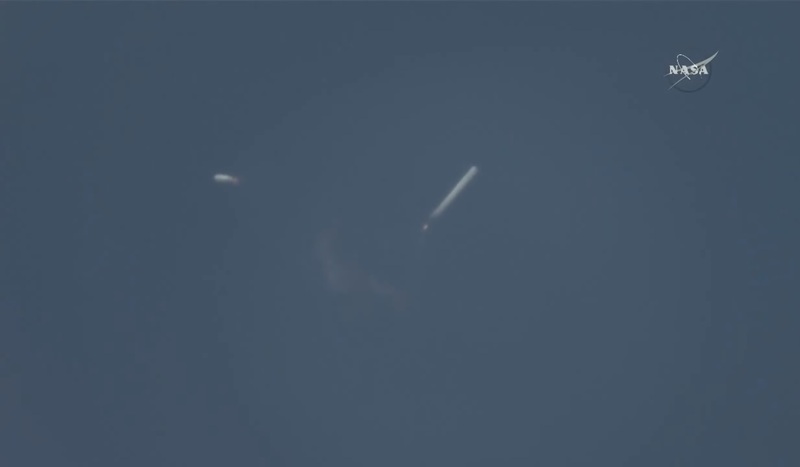 Comm loops were quiet as Falcon 9 checked off its critical pre-launch steps and Dragon began doing the same at T-35 minutes when its own auto sequence took over. 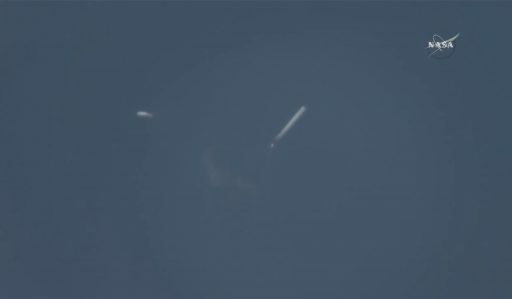 The pace of countdown events picked up at T-7 minutes when Falcon 9 began chilling down its nine Merlin engines, worked through engine actuator and trim valve exercises and transitioned to internal power. The Strongback structure was retracted by 1.5 degrees to be ready for a rapid kickback at the moment of liftoff and Falcon 9 armed its Autonomous Flight Termination System. Falcon 9 then proceeded into tank pressurization and a final GO was voiced from the Range Control Center and the Launch Director, allowing the rocket to take over control for the final minute of the count. Flames erupted from the base of the rocket at T-3 seconds when the nine Merlin 1D engines came to life and throttled to a combined thrust of nearly 700 metric ton-force to lift Falcon 9 off the ground. Liftoff occurred at precisely 21:07:38 UTC and Falcon 9 rumbled away from its historic launch complex, balancing in a vertical orientation for the first 15 seconds before attaining its north-easterly launch azimuth to send Dragon into the orbital plane of the Space Station. Guzzling down 2,500 Kilograms of densified propellants per second, Falcon 9 enabled Propellant Utilization half a minute into the mission to optimize the mix delivered to the nine engines. After passing the speed of sound, Falcon 9 throttled back for a brief moment around Maximum Dynamic Pressure at T+1:18 when stress on the rocket reached its peak on the way through the dense atmosphere. MECO – Main Engine Cutoff – was called two minutes and 22 seconds into the flight after the first stage boosted the stack to a speed of 1,684 meters per second. The two stages were pushed apart by a pneumatic separation system three seconds after MECO and both stages did not waste any time after parting ways 65 Kilometers in altitude as Stage 1 immediately went into post-separation maneuvers with its cold gas thrusters and Stage 2 headed into start-up mode. Ignition of the 95,000-Kilogram-force MVac engine occurred two minutes and 33 seconds into the flight and the second stage was tasked with a planned burn of 6 minutes and 48 seconds to accelerate Dragon to orbital velocity. Passing 115 Kilometers in altitude just after the three-minute mark, Dragon dropped its protective Nose Cap as aerodynamic forces were no longer a danger to the delicate Common Berthing Mechanism on the top side of the spacecraft. The rocket’s first stage executed its flip maneuver immediately after separation and fired up three of its Merlin engines two minutes and 36 seconds after launch for a 52-second boost back – reversing course and accelerating back toward Cape Canaveral. Peaking over 120 Kilometers in altitude, the first stage spent three minutes outside the atmosphere – again swinging around to point the engines forward for re-entry. Falling back toward Earth at supersonic speed, the booster fired up for the entry burn at T+6:05 – initially lighting the center engine to provide stabilization for the ignition of two outer engines after four seconds with shutdown occurring in the same staggered fashion. The 18-second entry burn slowed the stage by around 310 meters per second from an initial speed of Mach 3.7. 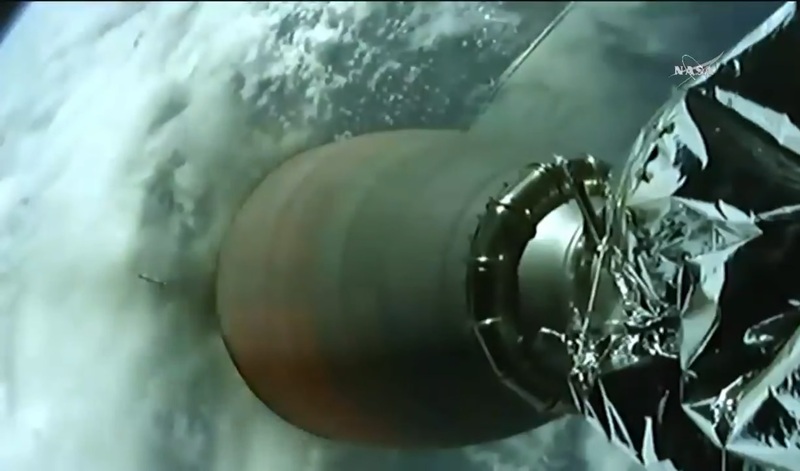 Live views from the core stage clearly showed the vibration of the booster in the entry environment and the trans-sonic phase as the vehicle went through the sound barrier for the second time. The four actuated grid fins were in charge of keeping the booster stable and on-course for 50 seconds of atmospheric descent before the center engine fired up at T+7 minutes and 10 seconds for the final landing maneuver. Entering a vertical descent toward LZ-1, Booster #1035 deployed its four landing legs and gently set itself down after a picture-perfect trip to space and back. The booster needed seven minutes and 41 seconds for the round-trip, setting a new record for the fastest out of the five LZ-1 landings to date as SpaceX continues to tweak the return sequence. After a near-bullseye touchdown, teams headed into remote safing procedures before crews could head out to the landing site to salvage SpaceX’s tenth recovered booster, the fifth to make an on-shore landing. What’s in store for F9-B1035 is not clear at this point, but the stage will most likely undergo refurbishment to be available for a re-flight mission as early as this fall if a customer can be found. SpaceX sources indicated this booster would be a prime candidate to demonstrate a more time-efficient refurbishment after the first re-flight vehicles paved the way toward streamlining the process. While the first stage’s journey came to an end, Stage 2 was still up and running – safing its Flight Termination System and entering terminal guidance mode for an on-target injection into what was expected to be an orbit of 200 by 360 Kilometers, inclined 51.6 degrees. Shutdown was confirmed 9 minutes and 19 seconds into the flight and SpaceX launch controllers noted a nominal orbit was reached. 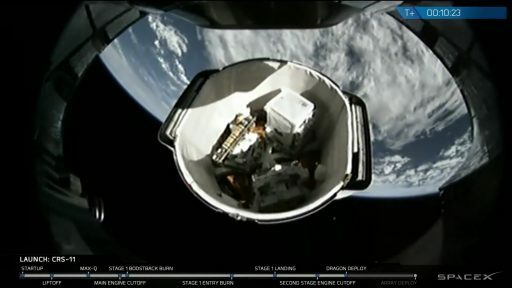 Dragon drifted away from the upper stage one minute after SECO, embarking on its first steps in orbit that consisted of firing up its Draco thrusters to stabilize for the separation of two solar array covers and the deployment of the two power-generating arrays 12 minutes after liftoff. The craft is planned to undergo several hours of testing which will include the final post-launch milestone two hours and 20 minutes into the flight when the GNC Bay Door is expected to be opened to reveal the craft’s navigation instruments and deploy the grapple fixture for the Station’s robotic arm. A series of orbit-raising maneuvers is on tap on Sunday to maneuver Dragon into an orbit 400 Kilometers in altitude where the vehicle will be catching up with ISS from behind and below. Capture by the Station’s robotic arm is planned at 14 UTC on Monday with berthing to the Station’s Harmony module later in the day to mark the beginning of a month-long stay with landing currently penciled in for July 2nd. 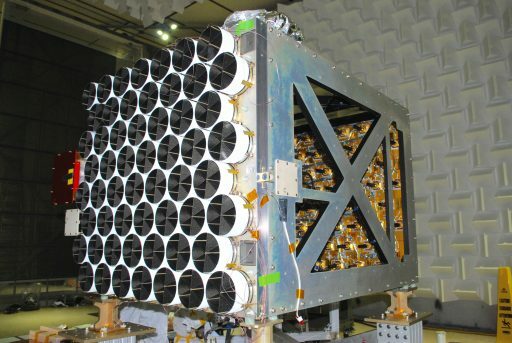 The next SpaceX Launch, currently targeting June 15, will see a ‘flight-proven’ booster lift off with Bulgaria’s first Geostationary Communications Satellite. 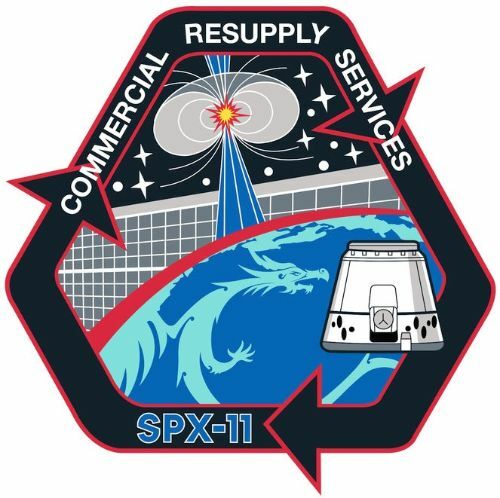 Copyright © 2019 Dragon SpX-11 | Spaceflight101. All rights reserved.